She Chose To Be Healthy And So Can You! Meet Allie Wallowitch, a former Saint Francis Healthcare Bariatric Surgery patient. Looking at the 26-year-old West Chester native you wouldn’t know she was almost 140 pounds heavier a few years ago. After a long struggle with her weight and looking into countless weight-loss options, Allie made the decision to have bariatric surgery in 2015. Allie says she got the confidence to lose weight after stumbling upon a weight-loss community on Instagram. She was 18 when she first considered surgery, but after attending a seminar, she felt she didn’t have an issue since most of the people there were heavier and older. “When I found the weight-loss surgery community on Instagram, I saw girls that were in their 20s and they did it and lost over 100 pounds. That gave me confidence that I could do it too,” she says. After revisiting the idea of bariatric surgery, Allie made the decision to call her local hospital to inquire about the surgery. “I remember the day so clearly. It was April 8, 2015,” she reflects. “I remember that’s when I decided to do it. I went to a seminar that week and that’s when I got the ball rolling. I downloaded MyFitnessPal [a mobile app that tracks diet and exercise] and decided to start exercising and losing weight [even though] I didn’t know how,” she says. Allie began her consultations at a local Pennsylvania hospital where they weighed and told her the ideal amount of weight for her to lose, which was over 100 pounds. After meeting with doctors she had to start a six-month supervised diet and exercise period. “I had to meet with my primary care physician each month and weigh in,” she says. Allie began keeping a food diary, and she credits Pinterest, the photo and idea sharing website, for all of the healthy recipes she found to keep her on track. Two to three months after beginning the process, Allie came to Saint Francis Hospital to finish her program. She had to have several pre-op visits with doctors to get cleared for surgery. This included checks for heart and lung health, as well as a psychiatric evaluation. She began attending the hospital’s seminars and met people who had already had bariatric surgery, and others, like her, who were going to have it. After passing her health evaluation and getting cleared for surgery, she received a date and had to go on a liquid diet two weeks before her surgery. “At this point I had already lost about 30 pounds on my own through diet and exercise, and that gave me confidence that I could keep going,” she says. In October 2015, Allie had a sleeve gastrostomy performed by Dr. Isaias Irgau. During the sleeve gastrostomy procedure, a thin vertical sleeve of stomach (about the size of a banana) is created using a stapling device, and the rest of the stomach is removed. By creating a smaller stomach pouch, the amount of food that can be eaten at one time is limited, so patients feel full sooner and stay full longer. After surgery, patients lose an average of 66% of their excess weight. 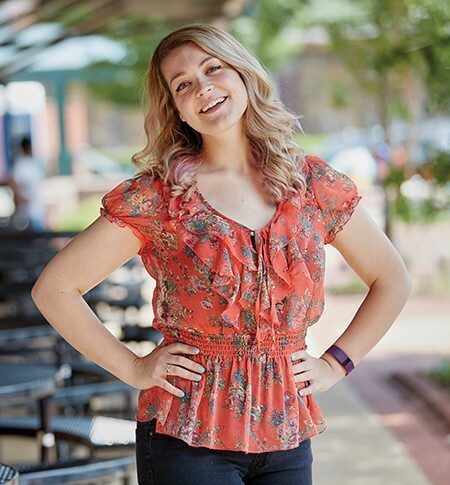 Now almost two years post-surgery, Allie says life is “pretty amazing.” She says she has more control over her eating habits and feels “more liberated.” She’s also more active. “I’ve traveled a lot these past couple of years, and I’ve been able to do a lot more. I don’t have to think twice about going up steps,” she shares. Allie says that after surgery, people began noticing her weight loss. “It took about 50 pounds for people to start mentioning ‘Oh, you look like you’ve lost weight. You look really good,’” she says. Besides exuding radiance and confidence, Allie is also having more fun with fashion. “Now I can go into any store and shop and I can fit into clothes. I remember crying the first time I could go to a normal store, fit into clothes and not have to think about it,” she shares. “I can borrow my friends’ clothes which is really good for me now,” she laughs. Allie says she still attends the bariatric seminars led by Dr. Gail Wynn, Medical Director of Bariatric Surgery at Saint Francis Hospital. “You hit stalls and you question everything, and it’s just nice to talk face-to-face with people who are going through it, too,” she says. “[Dr. Wynn] is really relatable. She’s helped so many people and she has a lot of good advice. That helps me be accountable,” Allie says. When Allie isn’t attending seminars, she enjoys hiking, yoga, reading fantasy novels and spending time with her two dogs. She wants people considering weight-loss surgery to remember that it’s a lifestyle change. “Even though it is life altering, that’s what you really need. It’s a lot easier feeling healthy. I think that’s what the surgery gave me — my health. I’m physically healthier and mentally healthier, so take the help if you need it,” she advises. 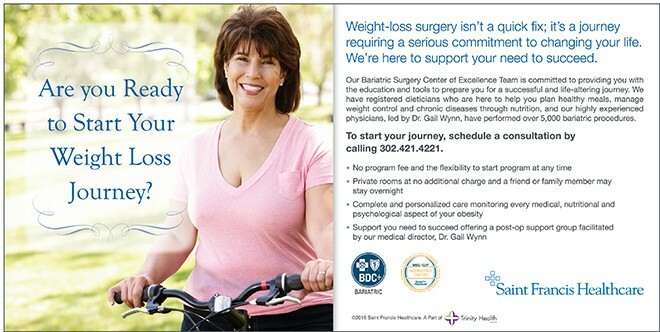 To schedule a consultation with the Saint Francis Healthcare Bariatric Surgery MBSAQIP Accredited Comprehensive Center, please call 302.421.4221 and mention the article in the Women’s Journal.